Jochen Rindt debuting the Lotus 72 at Jarama in 1970. The initial design faired poorly against the opposition, Jackie Stewart's private March and Jack Brabham's Brabham the class of the field in the early races. In a race of attrition - only five cars made it to the finish - Rindt qualified in the midfield pack, nine tenths down on Brabham's pole, and retired as early as lap 9 due to a failing ignition. Number two driver John Miles even failed to qualify, with Graham Hill scoring the marque's best result with a fourth in Rob Walker's trusty 49C. After that sound thrashing by Ken Tyrrell's squad, Team Lotus reverted to the 49C itself, Jochen winning Monaco in it (the 49's final victory), before returning with an adapted C-spec 72 at Zandvoort. Rindt won convincingly, and with consecutive victories at Clermont-Ferrand, Brands Hatch and Hockenheim Jochen pulled out an unassailable championship lead. After the Austrian's fatal accident at Monza, young Emerson Fittipaldi successfully snatched points away from nearest rival Jacky Ickx to allow Rindt and Lotus to win both 1970 championships. Rindt's replacement then went on to race to the car's second title in 1972. The car that most definitely marked the whole first half of 1970s was the Lotus 72. Ask long-time racing fans what car pops up in their mind when you say 'Formula 1' and at least half of them will think of wedge-shaped black and gold type 72. It's partly because the Lotus 72 participated in as much as six seasons and 74 World Championship races but most of its fame this car owes to its success story - 20 Grand Prix wins, 2 Drivers Championships and 3 Constructors Championship titles, results unabridged for more than a decade. Design thinking was moving like a wave at the end of 60s: wings and aerodynamics, 4-wheel drive, tyre developments... On their part, Lotus introduced the dominant Ford-Cosworth DFV engine in F1 in 1968. They had new car for it, called the type 49. It was a simple and successful car, constantly developed during its three-and-a-half years' lifetime. However, its intended replacements, the turbine powered type 56B and the 4WD type 63 both failed, which meant type 49 was retained in use for longer than intended. Its successor simply had to be a big step forward. Type 72 was a 2WD Cosworth-engined car designed by Maurice Phillippe and supervised by Colin Chapman. So Lotus got back to conventional thinking? Not so. Type 72 embedded many novelties, some of which were of revolutionary importance. Its unique wedge shape was derived from type 56. The water radiator was moved from the nose and split into two, situated on sides of the cockpit. That improved aerodynamic flow and moved the weight bias towards the rear end. This was considered important to ensure better traction because of high engine power and torque. Steps in the same direction were the biggest-yet rear wing with three separate pieces and new Firestone tyres. Suspension was designed with torsion bar springs with progressive rate. Front suspension had anti-dive geometry to prevent the car from burying its nose under braking (for which type 49 was notorious) and rear suspension had anti-squat geometry to prevent the car from lifting its nose under acceleration. All of that should have ensured that the car maintained the same ground clearance, irrespective of fuel load. Unsprung weight was of newly found importance and consequently all four brakes were mounted inboard. Front brakes acted to the ground via hollow brakeshafts. Front suspension consisted of upper and lower wishbones, torsion bars, anti-roll bar and telescopic dampers mounted inboard. Rear suspension incorporated a lower wishbone, top link, only one radius rod since the suspension was relieved of braking loads (because the brakes were mounted inboard), torsion bars, anti-roll bar and telescopic dampers, also mounted inboard. They were soon resituated to an outboard position because of overheating. The bathtub-type monocoque was made of sheet aluminium and had a subframe with the rear suspension attached at its front and an engine/gearbox/suspension block attached onto the rear. 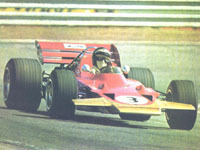 As such, the car debuted in the Spanish GP on 19 April 1970. Drivers were Jochen Rindt and young John Miles. It was a poor showing. Another outing, at the BRDC International Trophy at Silverstone 7 days later, delivered another poor showing. The car was temporarily withdrawn from service and thoroughly reworked in Lotus' factory. Chassis 72 R2 (Rindt's car) had both anti-squat and anti-dive removed to improve road holding in corners while 72 R1 (Miles' car) was less extensively modified with removal of only anti-squat. Internal designation for these modifications were B (for removal of anti-squat) and C (for removal of both anti-squat and anti-dive). Type 72 came good after these modifications, R2 scoring the type's first victory at Zandvoort. Rindt went on to win four consecutive races to ensure a huge lead in the drivers' table. Also, a major innovation appeared at the British GP: an airbox. The airbox is an aerodynamically shaped air intake sealed to the engine inlet trumpets which increases the pressure of the air entering the engine and thus increases power. However, the fairy tale was to be interrupted. On Saturday morning's free practice in Monza Rindt tried his 72C without any wings. This arrangement was thought to be better suited to the high-speed Italian circuit. While braking from maximum speed on the entry to the famous Parabolica Rindt's wingless car snapped to the left, hit the poorly installed safety barriers and was demolished instantly. Jochen Rindt died from his injuries. The probable cause of the accident was a failure of one of front brakeshafts due to poor manufacturing. Rindt was replaced in the team by a young Brazilian named Emerson Fittipaldi who rose to the challenge magnificently and won the penultimate race of the year in USA to clinch world titles for both Jochen Rindt and Team Lotus. 1971 was a bad year. The Rindt accident hung over the team like a dark shadow. Furthermore, there were legal problems and Fittipaldi had a road accident. All that summed up to only a handful of podium places and no wins. D specification was introduced on Fittipaldi's car at Monaco: rear suspension gained one more radius rod and the lower wishbone was replaced by parallel links. Further modifications on the cars saw a new one-piece rear wing and different oil tank designs. Was it because Tyrrell had begun to look as a two-driver superteam with Stewart and Cevert both able to win races, or for some other reason, that Lotus decided to pair Fittipaldi with someone of equal ability? Ronnie Peterson, the rising star from Sweden and 1971 runner-up, was invited into the team for 1973. The year saw new regulations to be imposed from the Spanish GP on. They incorporated 20cm wider bodywork with mandatory deformable structures. Phillippe left the team and its new designers were Martin Ogilvie and Ralph Bellamy. The first two races in South America were however held under 1972 regulations. Lotus ran 72D cars for Fittipaldi and Peterson. Fittipaldi won both races and Peterson showed strongly too, qualifying on pole in Brazil, only his second race for the team. In Brazil these old cars were head and shoulders above the opposition, setting times 1.5 seconds quicker than the fastest non-Lotus runners. Immortal design was at its very best. However, later in the season the cars had to be redesigned. Previously detachable, sidepods now were moulded into monocoque making up the deformable structure. This specification was called 'E'. Further modifications were made on the rear wing and oil tank (as usually) and the suspension had to be extensively modified to suit the ever-changing tyre designs. The new cars were better suited to new tyres but Lotus had to stretch its capacities to the limit to tailor the cars to the changing conditions. 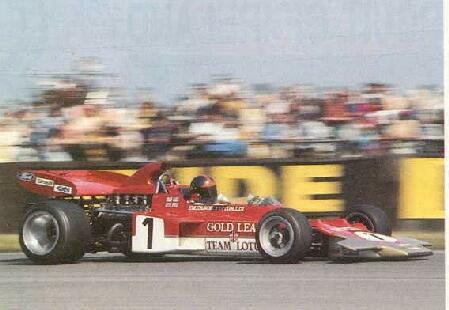 Reliability wasn't as good as it had been and things began to go downhill for Fittipaldi. Yet he won one more race and Peterson won no less than four in the second part of the season. Lotus thus took the constructors' title but Tyrrell's Jackie Stewart won the drivers' title having won five races. Had the Lotus effort been concentrated on one driver, they might have been able to win both titles. Fittipaldi felt neglected and headed for McLaren for 1974. It was to prove a good move as he won the drivers' title. Peterson was partnered by Jacky Ickx. At last, after four years of competition, 72 was destined to be succeeded by type 76. But that car proved to be a failure and the drivers had to revert back to 72. Undaunted by the prospect, Peterson drove brilliantly and won three races on three most diverse circuits - Monaco, Dijon and Monza - while rain man Ickx won a wet Race of Champions. That was the best the old cars could do. 1975 was a disaster - not surprising for a late-1969 design. By that time cars finally became unsuitable for the latest generation of tyres. The weight bias was too much rearward and the cars couldn't heat front tyres adequately. Wider front track was tried and also a longer wheelbase by 5 cm to cure it. Cable-operated torsion bars were tried which worked only under tension, as did a combination of torsion bars and coils. F specification (here driven by Brian Henton at the 1975 British GP) was introduced with coil springs instead of torsion bars at the rear. But nothing helped. Ickx left mid-season and Peterson fought to the end grabbing 2 points at 72's last race, the 1975 US GP. R1 was rebuilt to C specification and redesignated R4. These cars finished its lifetime on a low note after being used for much longer than intended but this surely cannot overshadow the incredible performances they have been putting in for almost five years. Times change and there will never be another car like that fabulous type 72. And it was a great looking car too.